It took me a while to find the right setting and baking method to use after applying foundation and concealer. I came to know that you must be your own beauty expert in this area to find what method to use to set and bake your face. I was following Youtube videos on how to set and bake but, after it was all said in done, I was looking like a ghost with a powdery face and very dry under eyes. What works for me may not work for you. I am going to share the technique(s) I use to set and bake my face. So, during the spring and summer season, my face is oily combination. First thing First- Keep your face and under eyes hydrated. - The makeup products you use have many ingredients in them that may dehydrate or soak up the natural oils on your face. Use moisturizing or hydrating products to protect your face from makeup products, minimize wrinkles and creasing, and of course make your makeup look flawless. Hydrating your face, paying close attention to your under eyes will not keep the setting and baking process form drying out your skin and accentuating you lines. Primers are also a very good to use as a barrier between your moisturizers and products you use for makeup. Once you apply your foundation and concealer, set your face with a face powder or powders that matches close to the shade(s) you use for concealer and foundation.Lightly sweep the pigmented face powder all over your face to set foundation and concealer. Use a smaller brush to set in the under eye area making sure your creases are set and smooth out. This technique is also good to used if your concealer turned out to be too light. You can used a face powder with the correct shade to tone it down or add back some color. Right now, I am using the Milani Conceal + Perfect Shine-Proof Powder in the shade Medium. 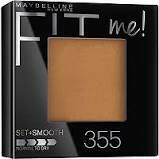 I love this pressed face powder because it's very lightweight, golden, and controls shine. I sometimes also use the bh Cosmetics Pro Contour Face Powder which contains 10 shades you can choose from. If you use cream or liquid contour, set it with a bronzer or a face powder similar to the shade of your contour. Use a loose powder to bake your face. What is baking makeup? Baking the your makeup means allowing the loose powder to absorb the moistness from your foundation and concealer leaving your skin naturally radiant or naturally matte. Yes, there's levels to baking. Many people bake for seconds, minutes, hours or days. No I am kidding, at most, for minutes, after completing other steps in their makeup look. It all depends on what finish you want; radiant or matte. Because you set with a pigmented face powder, you can freely use a loose translucent powder. Yes, I said translucent and the reason why is because the translucent loose face powder will not absorb into the skin creating a white cast. The setting face powder came first and will not let the translucent face powder take it's spot. It will set on top of the face powder you use to set and when you sweep it off, the translucent powder will come right off. And yes, you can use pigmented loose face powders too. At the moment, this is my favorite drugstore go to loose face powder by Black Radiance True Complexion. Set before you bake. For my face, I would't go straight in with a loose powder because loose powders tend to gravitate and stick in to areas creating a cakey, dry finish. Setting with face powder set the face and preps it for the loose powders. Look in the mirror and see how smooth and evenly your face looks after trying these techniques. For best results, spray with a setting spray to melt everything into the skin. How do you set and bake your face?